The development which is located on the site formerly accommodating the old Wynnum Library features a variety of mixed dwellings. CBRE Residential Projects Managing Director said that the project quietly commenced marketing two weeks ago and has already sold 25% of apartments, primarily to local owner occupiers who reside in the area. 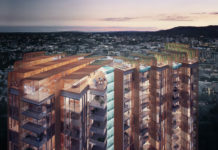 Director of Ellivo Architects Mason Cowle said the brief was to design a premium product that would appeal to the discerning owner occupier market. Mr Barratt said prices for a 2 bedroom, 2 bathroom apartment at Enclave start at $480,000, with 3 bedroom apartments starting at $649,000 and three storey townhouses from $930,000.